The owner of Employee Time Clocks contacted us because he was looking for a WordPress Expert. The website was not performing well, no purchases were getting completed, it was slow loading and had some minor problems with appearance. EmployeeTimeClocks.net was built to replace an aspx website (Microsoft Active Server Pages). The new website was built with WordPress and uses a custom coded theme and used WooCommerce including multiple Add-Ons and custom coded WooCommerce Templates. The developer of the site is no longer available and problems were cropping up so WPTechGuru was called to take over. The primary problems were errors and unused plugins as well as orphans in the database. 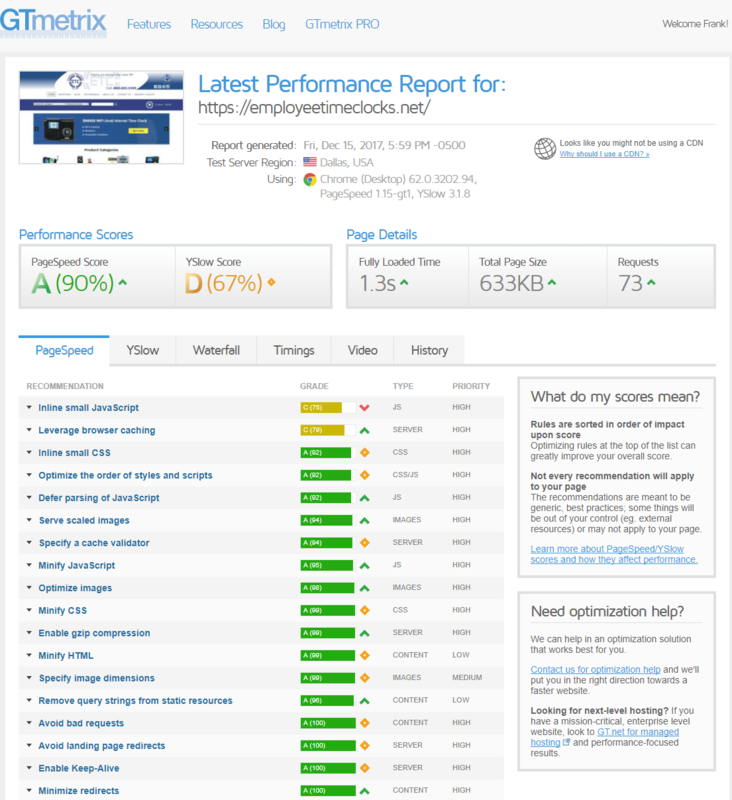 Another problem is the site was using multiple optimization and caching plugins. After backing everything up we updated WordPress Core and all Plugins. We also removed approximately a dozen plugins after determining they were not needed. Then replaced a few plugins with premium plugins licensed by Frank’s Designs. The website was using EWWW Image optimizer which we replaced with WP Smush Pro to improve image optimization even further. The website was using Revolution Slider which was replaced with Soliloquy for faster loading. Once the site was running more smoothly we installed WP Rocket and configured it to work we’ll with a WooCommerce website. We replaced the SSL Certificate and resolved several issues to ensure the entire site is working properly using HTTPS. The original developer of the website used custom WooCommerce templates. The code was outdated and had to be brought up to date to current standards. The site was made compatible with PHP 7.1. Finally we programmed the theme to support several WooCommerce customizations requested by the owner. This was primarily related to the display of single products and special attributes and displaying related products. This project was an excellent opportunity to demonstrate the broad range of skills and capabilities of WPTechGuru. We welcome your questions.